This describes itself as a new concept in “the coming together of delicious Indian food and great craft beer”. 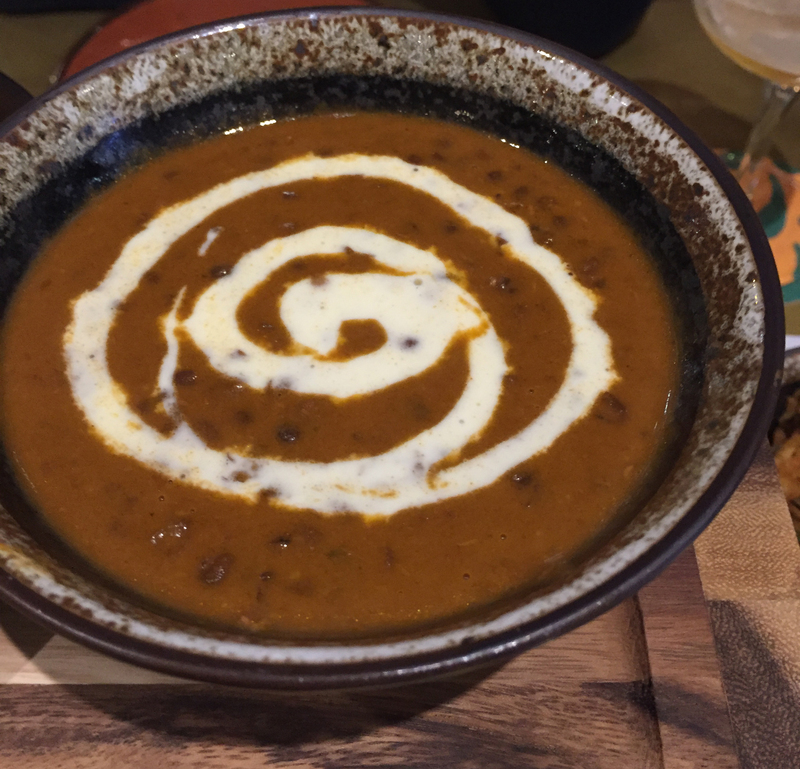 It serves northern Indian food using a tandoor oven but then pairs them with different craft beers. This is quite an art, as most Indian food is spicy and would mask the overall flavour of the beer. They solve this by not making the Indian food that spicy – delicate would be the best way of describing it, so don’t go here to get a huge flavour boost. The menu has 14 food items and 10 beers, if you don’t count the ones that are hiding in the small print at the bottom. You can order the beer in small portions, which is handy if you fancy trying a range of flavours. We started with popadoms which are a bit different. 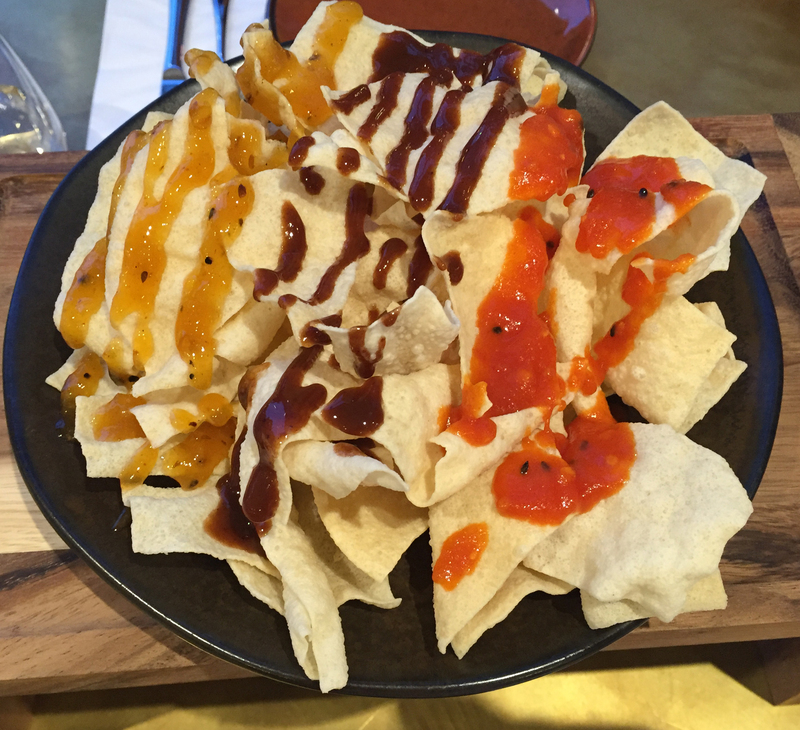 They have daringly covered the little warm papadoms with spicy tomato, spiced mango and tamarind. It looks very pretty and here there is an instant chilli hit from the mango and tomato. But eat the tomato side first as it gets a bit soggy. You can enjoy that with your first small beer, leaving plenty of opportunity to try ones further down the list. We then ordered a lamb burger and a lamb kebab and sides of pilau rice, dal and bhindi jaipuri. 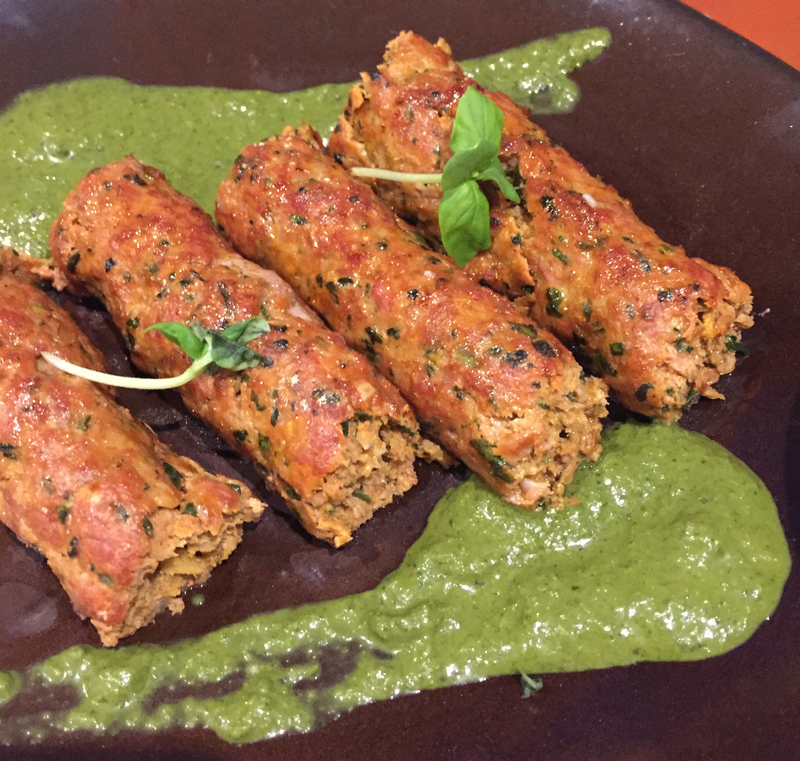 The kebab comes with a green coriander sauce which has a hit of chili. 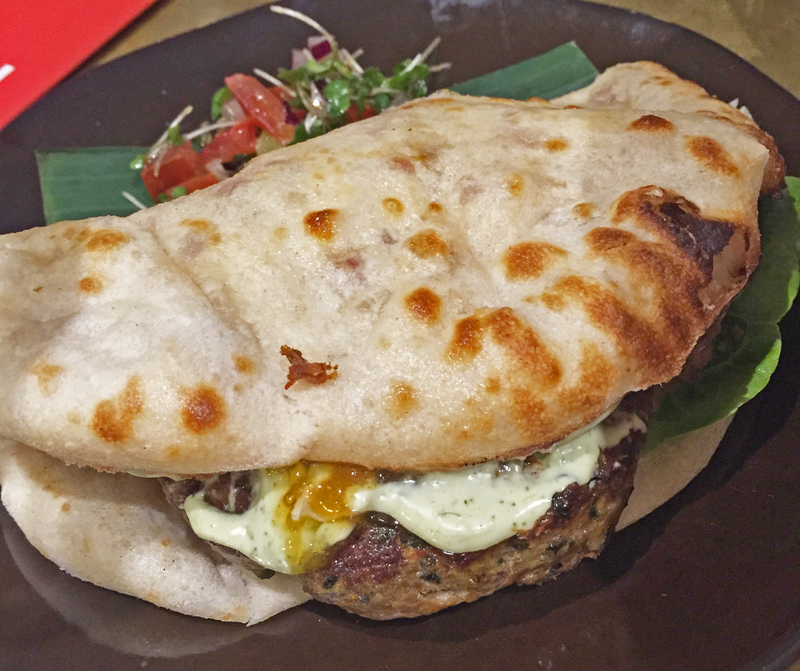 the burger is self contained with the mango chili sauce and minted mayonaise all wrapped in a naan. This was a definite hit and after the many trials of burgers this was good and the naan meant you could eat it to the end without losing most of it in your lap. The pilau rice was fragrant with cumin and a hint of saffron, and the dal was interesting with black lentils and tomato. It also had quite a lot of yogurt, so was a bit too creamy. But it did act as a good sauce with the rice. 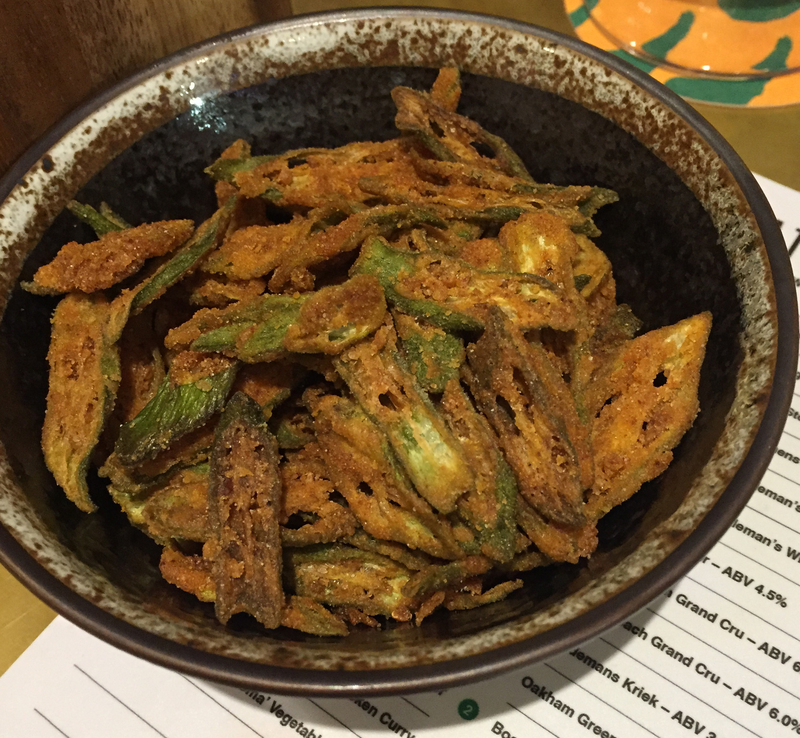 There is a split decision on the bhindi jaipur. It is very crispy with gram flour and dried mango and all we are prepared to say is to try it only if feeling adventurous. We washed all this down with glasses of Booma lager (4.5%) and Oakham Green Devil IPA (6%). The descriptions of the beers are definitely to be followed. 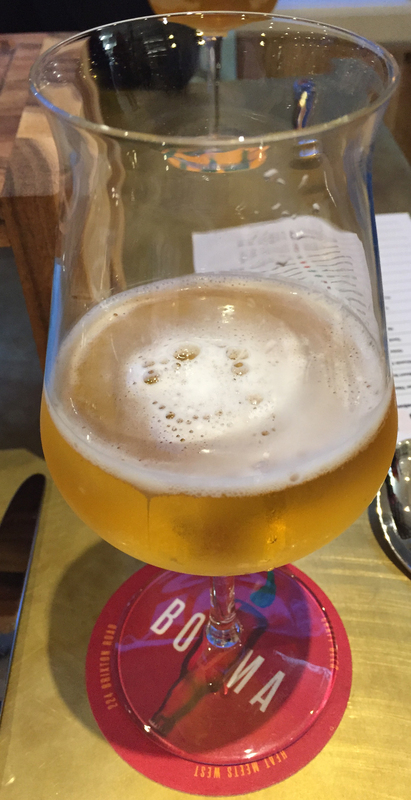 The IPA was very floral, the lager … well just lager. The staff were very attentive. There were four on duty that Saturday and all of them asked at least once whether we liked the food. The bill for two of us came to £37.95 including a tip. This is a small restaurant and they don’t take bookings, so it is first come first served. But it is next to the Crown and Anchor and if you wait in there with your first round of beer they will come and get you when the table is free. We will be returning but not just yet.